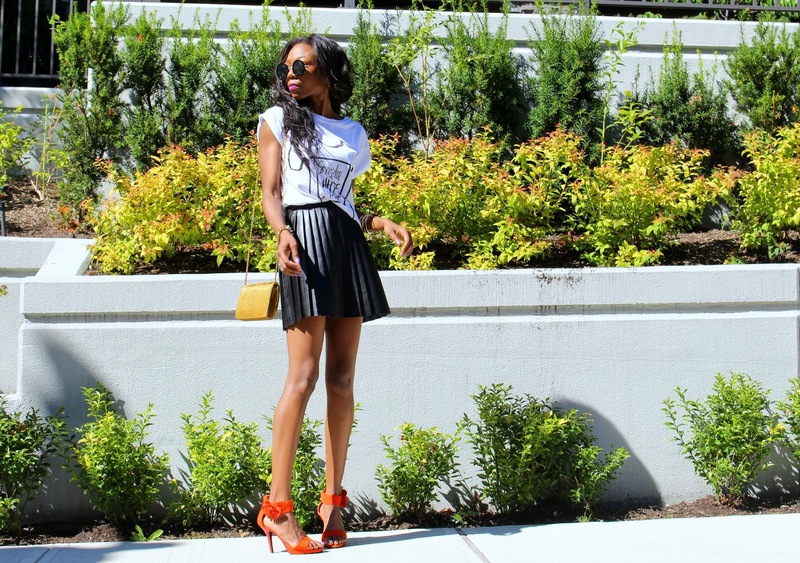 A White Tee + Bright (Signature) Lipstick + Any Simple Bottom + Kicks/ Heels = Game! Who’s with me on this one? Have you considered just a white tee outfit? In this last photo I was laughing because a home-stay dad after having watched me take photos, just shouted from his window ” Make sure you don’t cause accidents” . On hearing that from the back, I looked up and burst into laughter. His kid was watching the whole time, too adorable. What would you wear your white tee with? On one fine and last note, I’ll be sharing a write-up that I’ve written over the summer, that has helped and will help you get through the last quarter of this year. Some things need to go for progress to take place in an extraordinary way. Smile a lot! Enjoy every moment of your week ahead ! Tees are everything!!!!!! I wish I could @people ton this comment. Oh wait I can do that on twitter, I'll brb. Your sunglasses, skirt and White Tee giving me so much life! Oh and I can't wait to see your write up! Love the tee and the shoes and the glasses and the clutch, in fact I Love everything, hehe. I need to get a Black skater skirt but Midi/Knee length soonish. You are smoking beautiful. Yess I agree with you, a simple white tee with denims are the bomb for me, with killer heels Lool. All envisioning in my little head. I saw this on Instagram and just wanted to come check this post out, I love love your blog btw. Lol girl,I love how your personality comes out through your writing. This look is stunning, I love the simple pairing and the addition of the orange sandals for a pop of colour. You look stunning! I love your shoe, white e on a blue denim wih a pair of brogues is my easy outfit. I love the shoes. Love the pop of color. Beautiful! Gorgeous skirt! Love your outfit. love the pleating on your leather skirt. and so would rock a white tee everyday, if i could find that perfect white tee for me lol. You look like a supermodel so I'm sure you made that stay at home dad's day. LOVE LOVE LOVE those heels. So fierce. great styling.